Up to 2.5 billion people hold and use the world’s community lands, yet the tenure rights of women—who comprise more than half the population of the world’s Indigenous Peoples and local communities—are seldom acknowledged or protected by national laws. 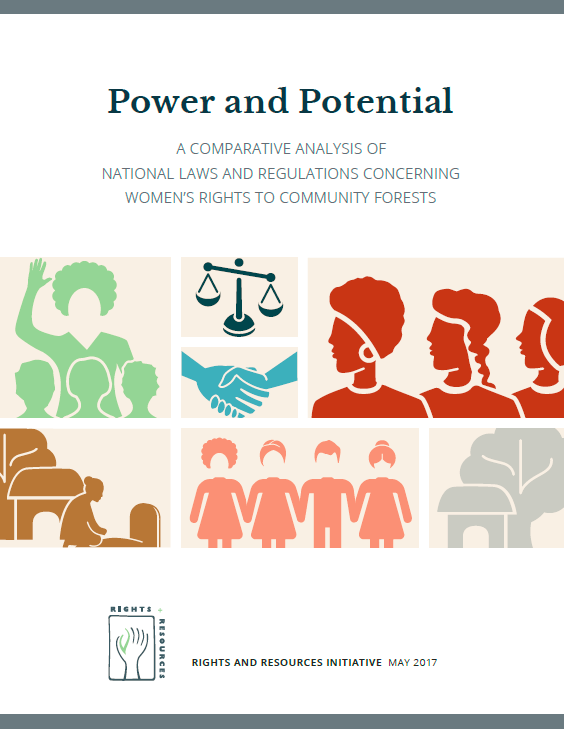 Although gender norms and women’s forest tenure security vary widely across community-based tenure systems, this analysis concludes that national laws and regulations on the rights of indigenous and rural women to inheritance, community membership, community-level governance, and community-level dispute resolution are consistently unjust, falling far below the requirements of international law and related standards. The 30 low- and middle-income countries analyzed in this study are ill-positioned to meet their obligations under the Convention on the Elimination of All Forms of Discrimination against Women; non-binding international guidance such as the Voluntary Guidelines on the Responsible Governance of Tenure of Land, Fisheries and Forests in the Context of National Food Security; and the Sustainable Development Goals, all of which necessitate the statutory recognition of women’s rights to community forests. Inadequate legal protections for the tenure rights of indigenous and rural women fail to reflect existing gender-equitable practices in indigenous and local communities, and enable other community practices that discriminate against women, thereby weakening women’s tenure rights, jeopardizing the livelihoods of women and their families, and threatening the advancement of entire communities. March 2018 Update: A companion analysis, Legislative Best Practices for Securing Women’s Rights to Community Lands, is now available. Download it here or in the “Relates Analyses” section below, where you can find more resources. 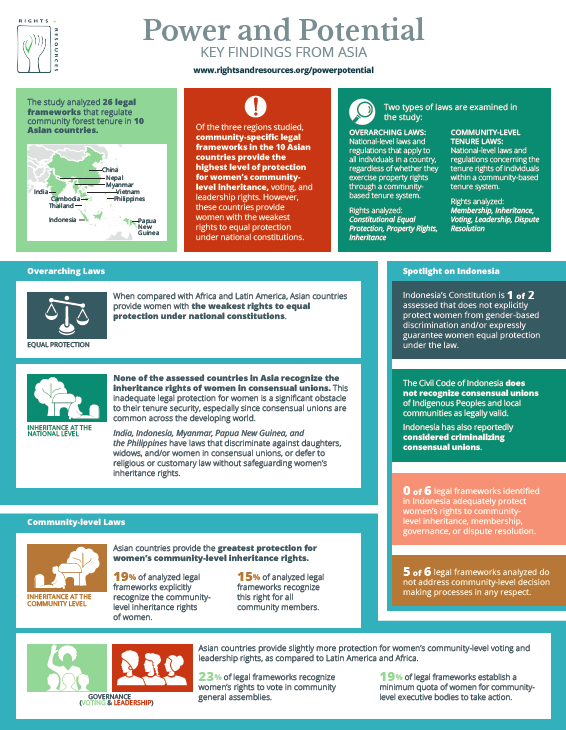 April 2019 Update: A third analysis, Strengthening Indigenous and Rural Women’s Rights to Govern Community Lands: Ten Factors Contributing to Successful Initiatives, is now available. Download it here. Governments are not respecting indigenous and rural women’s tenure rights and are failing to meet international obligations to do so in all 30 low- and middle-income countries assessed. All of the countries analyzed have ratified the UN Convention on the Elimination of all Forms of Discrimination Against Women (CEDAW) and yet not one meets the minimum standards established in the convention. Only eight of the 30 countries have intestate inheritance laws that provide equal protections. More than a third of the countries assessed (India, Indonesia, Kenya, Mali, Myanmar, Panama, Papua New Guinea, Philippines, Senegal, Tanzania, and Zambia) have laws that legally discriminate against daughters, widows, and/or women in consensual unions, or defer to religious or customary law without safeguarding women’s inheritance rights. Constitutional equal protection: 93 percent of the countries examined prohibit gender-based discrimination or explicitly guarantee women equal protection under the constitution. Property rights: Only seventeen of the 30 countries analyzed specifically affirm women’s property rights. Inheritance: Only eight of the 30 countries assessed mandate that daughters, widows, and unmarried women in consensual unions have equal rights to inherit alongside their male counterparts. Countries reviewed in Africa (11) provide the most consistent affirmation of women’s property rights and greatest recognition of women’s community-level dispute-resolution rights, but they also afford indigenous and rural women the weakest community-level inheritance and voting rights. 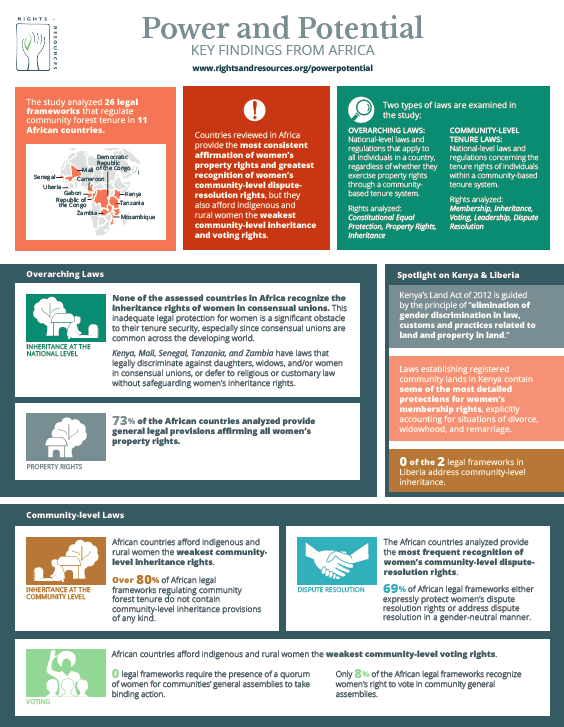 Of the three regions, community-specific legal frameworks in the 10 Asian countries provide the highest level of protection for women’s community-level inheritance, voting, and leadership rights. 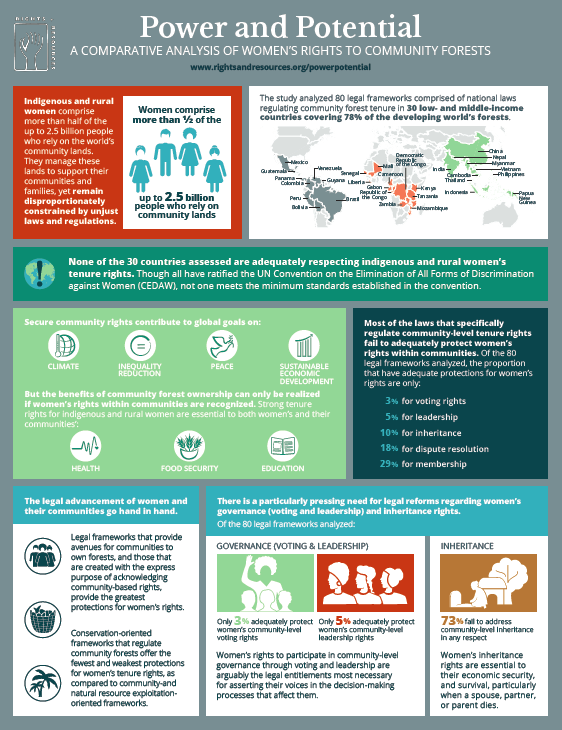 None of the Asian or African countries in the study recognize the overarching rights of unmarried women in consensual unions to inherit land through intestate succession (inheritance rights in the absence of a will), and between 45-50 percent of assessed countries in both regions do not equitably protect women’s inheritance rights. 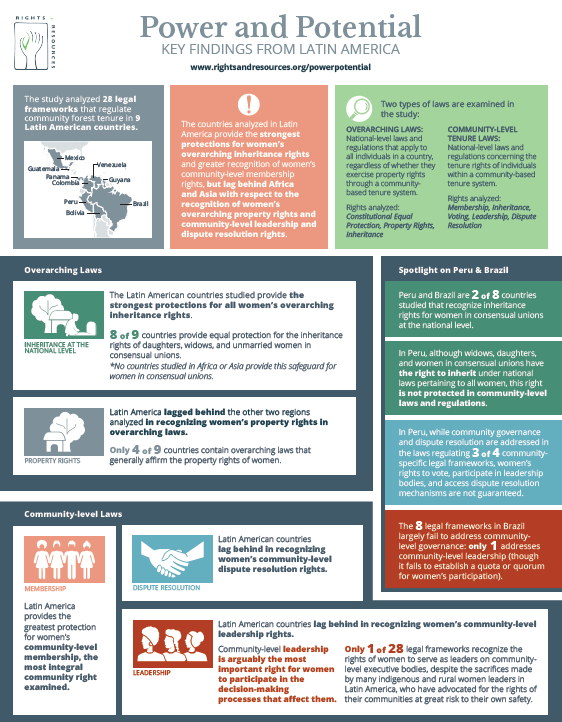 The nine countries in Latin America provide the strongest protections for women’s overarching inheritance rights and greater recognition of women’s community-level membership rights, but lag behind countries in Africa and Asia with respect to women’s community-level leadership rights and the affirmation of women’s property rights in overarching laws. Eight of the nine Latin American countries assessed provide equal statutory protection for the overarching inheritance rights of daughters, widows, and women in consensual unions; these are the only countries among the 30 reviewed LMICs that safeguard the inheritance rights of women in consensual unions. There is a particularly pressing need for legal reforms regarding women’s governance (voting and leadership) and inheritance rights in community-specific legal regimes. Inheritance rights are the most ignored, while leadership rights are the least protected.